2018 doesn’t look like it’ll be a quiet year: Iranian protests continue, and so do Trump and Kim Jong Un in their phallic measuring contest with nuclear weapons (“I have the button on my desk”– “Oh yeah? I do, too, and mine is bigger”). The former Chief Strategist Steve Bannon fires up the feud against his nemesis during the White House days, Jared Kushner. The January 3rd edition of the British newspaper Guardian1)Trump Tower meeting with Russians ‘treasonous’, Bannon says in explosive book, The Guardian 2018-01-03.opens with “explosive revelations”. 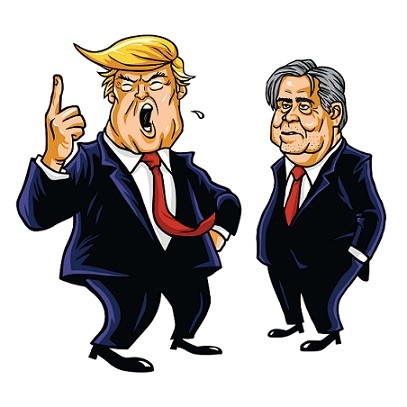 Michael Wolff interviews Steve Bannon about the latter’s book “Fire and Fury: inside the Trump White House”, which calls Donald Jr’s (Trump’s first born son) meetings with the Russian lawyer Natalia Veselnitskaya “treasonous” and “unpatriotic”. Most media stop there. Most liberals, fuelled by their hatred towards Donald Trump, also stop there and take it to Twitter because that’s how far their political slacktivism can go. Then Trump replied on the wave of emotions and everything went nuclear. Since everyone seems to be too emotional not only to read through the lines, but actually to simply read the lines, we’ll offer some strategic analysis and put everything into context. 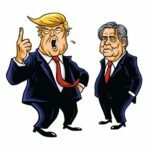 If you want to know what Bannon thinks, you either ask him or read Breitbart, which presents the same revelations with a rather different focus, ignoring Donald Jr. while highlighting Kushner’s role.2)Report: Bannon Says Mueller Investigation Will Target Kushner, Manafort’s ‘Greasy’ Money Laundering Deals, Breitbart 2018-01-03. A second article on the topic targets the power couple Jared and his wife Ivanka.3)Book: Donald Trump Mocked Key Early White House Staff, Thought ‘Jared and Ivanka Should Never Have Come to Washington’, Breitbart 2018-01-03. Most importantly, the first article on the home page, highlighted in capital letters, is again about Jared Kushner.4)‘Mr. Perfect’ Jared Kushner’s Not-So-Perfect Year, Breitbart 2018-01-03.The article is penned by Adam Shaw, who happens to be one of Bannon’s most trusted writers, and lists essentially everything that’s wrong with Kushner, suggesting what Trump should do with him. 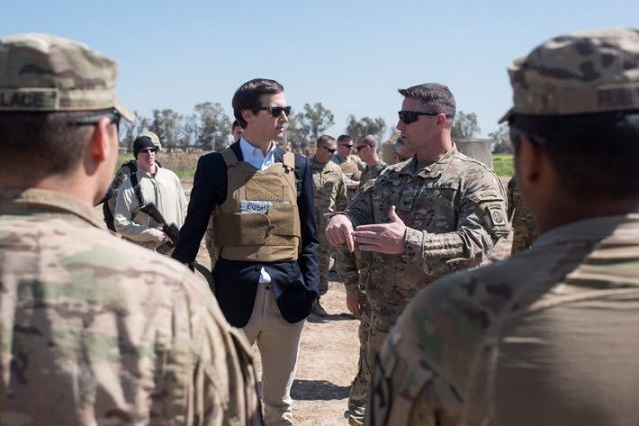 The opening is nothing short of an insult, underscoring how the husband of Trump’s daughter Ivanka appeared to the US troops in Iraq: under the flak jacket, Jared sported his typical rich-boy blazer and khakis, because that’s all he is about and he can’t renounce his materialistic symbols not even when on a military trip. As such, in the eyes of Bannon, Jared Kushner is nothing but a spoilt heir, who never had a real job in his life, owes everything he has to his family’s wealth and connections and is exclusively preoccupied with his own lavish lifestyle; he’s not fit to understand the problems of marines overseas, nor the middle-class American, who would be the main beneficial of Bannon’s economic nationalist platform. The second and third paragraph present how Kushner is not a conservative at all, but a Democratic mole in the Trump administration, for his support for open borders immigration policies and LGBT causes; he’s also a fountain of bad advice, as allegedly Trump himself called him. The fourth to sixth paragraphs are a hint of Donald Trump himself: if Mueller’s special counsel is ever going to find anything, it’ll be Kushner, therefore Trump should get rid of him as soon as possible. Kushner is involved in too many shady deals like those in real estate and very much like the Democrat mole he is, he’ll repeat the same lax behaviour Hillary had in her use of non secure servers to handle confidential emails. The last one highlights Kushner’s alleged poor understanding of geopolitics. In conclusion, for Breitbart and therefore Bannon, Kushner is a spoilt rich heir, with no real life skills whatsoever that could be useful to the Trump presidency, a source of bad advice, detached from the real problems afflicting middle America, focusing on frivolous issues like LGBT or his preppy shoes, a person who could be used to incriminateTrump. He’s the perfect representative of the out of touch globalist elites and their policies that Trump ran against and won. If Trump wants to achieve anything with his presidency, Kushner must go. Otherwise Kushner will destroy the Trump presidency and drag Trump down with him. Paragraph three also has a hint for Kushner and Ivanka themselves: leave of your own will. Fortunately for them, Trump has taken the assault on them as a declaration of war against himself. He fired back at Bannon the same way he fires back and forth with Kim-Jong-Un, had already got his lawyers involved and didn’t get the message at all. Bannon’s New Year’s first shot against Kushner backfired and ended up hitting Trump. Excellent comprehension and exposition. Well said! So just opinions all around. Seems the book and all related press is just clickbait? !